Historically, Calimesa began as a small rural town with mostly single-family homes and ranches. With completion of U.S. Route 99 (modern day I-10 freeway), businesses opened and Calimesa began to feel a separate identity from the larger neighboring town of Yucaipa. In June 1929 nearly 100 residents attended a meeting and decided to apply for their own post office and to state a “name contest” in which the winner was paid $10. Calimesa was chosen from 107 names submitted; and is said to come from “cali” (meaning California) and “mesa” from the Spanish word meaning “table" or table-lands.” The first post office was the grocery store at Calimesa Boulevard and Avenue "K". The city is accessible from the Interstate 10 Freeway, which geographically traverses the city from north to south. Major transportation corridors include County Line Road (which runs east-west from the freeway), Sandalwood Drive (which runs east-west from the freeway), Singleton Road (which runs east-west from the freeway), Cherry Valley Boulevard (which runs east-west from the freeway), Avenue "L" (which runs east-west from the freeway), Myrtlewood Drive (which runs east-west from Calimesa Boulevard to California Street), Calimesa Boulevard (which runs north-south and parallels the freeway from Live Oak Canyon Road in Yucaipa to Cherry Valley Boulevard/Tukwet Canyon Parkway near Beaumont), and Bryant Street (which runs north-south from Highway 38/Mill Creek Road/Mentone Boulevard and connects with Singleton Road). The city has no airports or direct access to railroads. The population was spread out with 1,414 people (17.9%) under the age of 18, 602 people (7.6%) aged 18 to 24, 1,513 people (19.2%) aged 25 to 44, 2,310 people (29.3%) aged 45 to 64, and 2,040 people (25.9%) who were 65 years of age or older. The median age was 48.8 years. For every 100 females there were 92.4 males. For every 100 females age 18 and over, there were 89.8 males. In the city, the population was spread out with 21.8% under the age of 18, 6.2% from 18 to 24, 23.0% from 25 to 44, 23.0% from 45 to 64, and 26.0% who were 65 years of age or older. The median age was 44 years. For every 100 females there were 88.6 males. For every 100 females age 18 and over, there were 84.8 males. 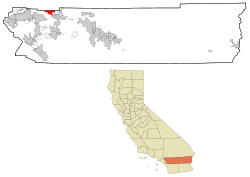 Calimesa, California Facts for Kids. Kiddle Encyclopedia.